3. Buy good foundation pieces. I do not care what kind of a deal that you got on that incredible Vera Wang dress. If your boobies are hitting your chin and I can see your underwear – it's just not pretty. The good news? Consumer Reports recently did a testing of bras and underwear and found that the best bang for retaining bust is the Gilligan & O'Malley line from Target. They make a variety of styles, in a large assortment of sizes, and cover almost every skin tone. Here's another tip, create a budget for your undergarments. I know, I know. It's sounds so silly but think about it. If you pick out the right garments, you can use them after the wedding is over. Think of it as an investment for your undies drawer. *1. Overstock.com Evanese Women's Long Dress with Shoulder Bands in Creme. *2. Old Navy Mosaic-Beaded Leather Sandals in Cool Combo. *3. Marisola Paricio Traditional 60 Inch Long x 108 Inch Wide Raw Cut Lauren Veil. *4. Payless Short Natural Illusion Necklace in Tan. *5. Payless Diamond Chandelier Earrings in Silver. *1. Amazon Strapless Taffeta Bridesmaid Prom Holiday Formal Gown Long Dress in White. *2. Amazon Pearl Edge White Wedding Veil with Comb in White. *3. Old Navy Faux-Gem Chandelier Earrings in Crystal. *4. Old Navy Large-Beaded Chain Necklaces in Clear. *5. Target Idalia Dress Sandals in Black. *1. J Crew Solid Embossed Beach Dress in White. *2. Amie Noel Designs Bella Rhinestone Beaded Bridal Headband. *3. Payless Moxie Strappy Flat Sandal in Purple. *4. Payless Teardrop Shell Earrings in Purple. *5. 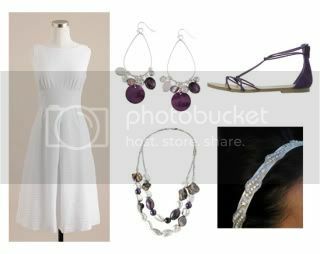 Payless Amy Short Necklace in Silver.